Coarse 4x1 twills and 2x2 basket weaves in loft cottons give an appearance of original hand loomed weaves. The texture is soft and yet rugged looking almost like a canvas as the dye lifts of in time and wear. Add a bit of warp cutting and wash fraying and these coarse denims become classy rags. 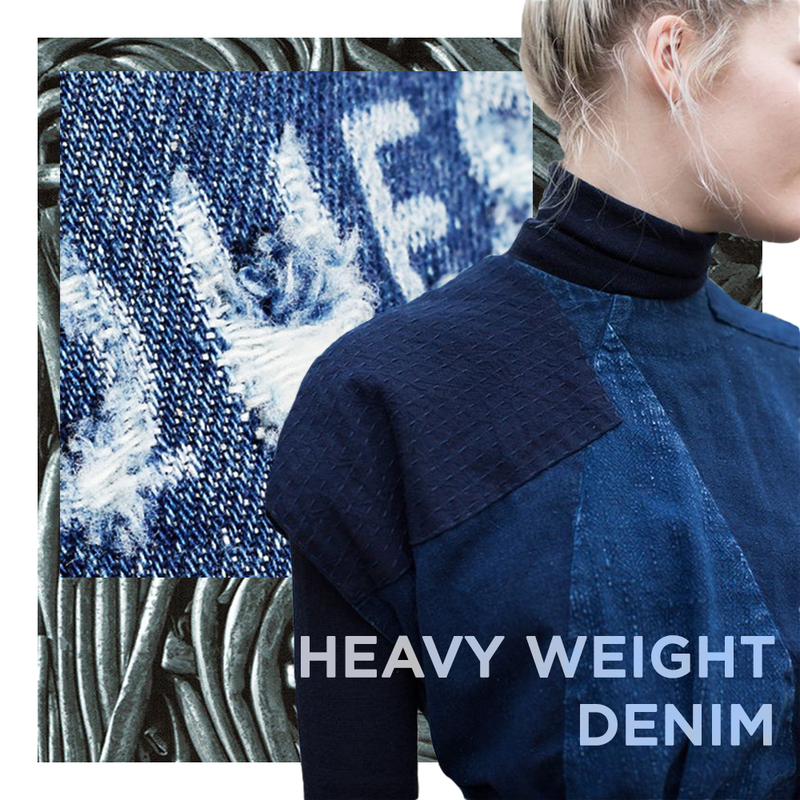 Heavy weight denims are naturally textured due to their weight and prominent twill line. The texture derives from the way that the indigo lifts off the twill in both laundry and personal wear. Brushed effects on both face and back in indigo are enjoying current fortunes. Face brushed creates a lovely soft face breaking up the indigo twill and especially when applied to a sateen resulting in an indigo moleskin. But it is not easy to achieve on indigo denim as the brushing picks up the warp/surface dye and shifts it around creating unwanted streaking effects. With care and acceptance of a lot of poor quality the results are superb. Backside brushing is easier and more cosy. Indigo denims are historically quite cool in the winter but with back brushing this is no longer the case. Heavy weight denims are mostly 3x1 and 4x1 twills Achieving and overall chunkiness to both denim and jeans. Such denims are reminiscent of the old style railroaders jeans and trucker jackets of the 1800’s.